In my family we are big hunters. I have been going hunting with my husband literally since our second date…. all those years ago. 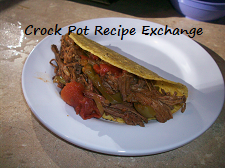 I’m always on the lookout for new recipes to incorporate what we’ve harvested during hunting season and this one was kind of one of those surprise finds. Let me explain. A couple of nights ago the phone rang and it was a friend of one of my husbands cousin’s (are you confused yet?). He said that he’d gotten our number from the said cousin and was calling because a deer had ran out into the road and hit his car. The officers on the scene were willing to let him have it if he promised it would be completely used (meaning no meat went to waste and a carcas just left laying). He assured the officer it would and quickly realized he had NO idea how to skin it out or work up the meat. So apparently that is when he started making phone calls. When he reached my husband’s cousin by phone they quickly suggested that they call him. That not only would he take it, but they knew for a fact that we’d cook it all up and not let any go to waste. I didn’t know what we were going to do with it. 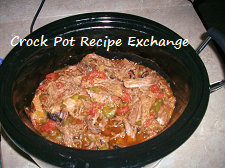 When we go hunting I plan accordingly (make sure there’s room in fridge and freezer, have plenty of empty crock pots and oven space, have all the extra ingredients I need to cook it up). Fortunately a friend of ours was planning on having his smoker going the next day to do some things for an upcoming fall festival so he gladly offered for us to put the venison onto the smoker. Thank goodness he had that smoker going. That venison was SO good and SO flavorful. We all ate until we were absolutely stuffed. Now the only problem was that there was a boat load of smoked venison left to do something with. I decided we would have more than enough barbecued venison throughout the winter so I wanted to try something different. Ohhh Emmm Geee!! Am I glad I did. 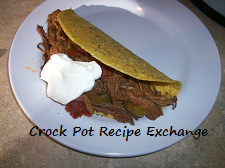 These crock pot venison tacos were over the moon delicious. And super super easy too. 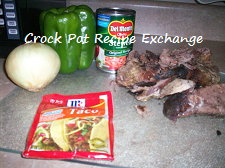 Add the venison, peppers, onions, tomatoes and seasoning packet to a 5 or 6 quart crock pot. 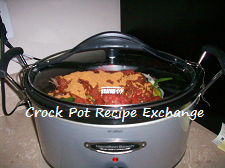 Put the lid on and cook on high for 3 – 4 hours or on low for 7 – 8 hours. 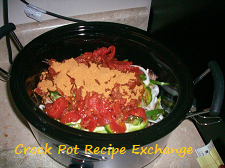 Once the onions and peppers have cooked down mix everything together. Serve in taco shells with your favorite taco toppings. I’m all about a “round 2 recipe” and not wasting any leftovers and this fit that bill perfectly. 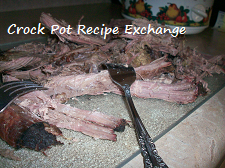 You could easily substitute any smoked meat in place of the venison too. We’ll definitely be making this often through the hunting season.